If it hasn’t already, the vibey NOMAD Bistro & Bar should definitely feature on your social calendar! 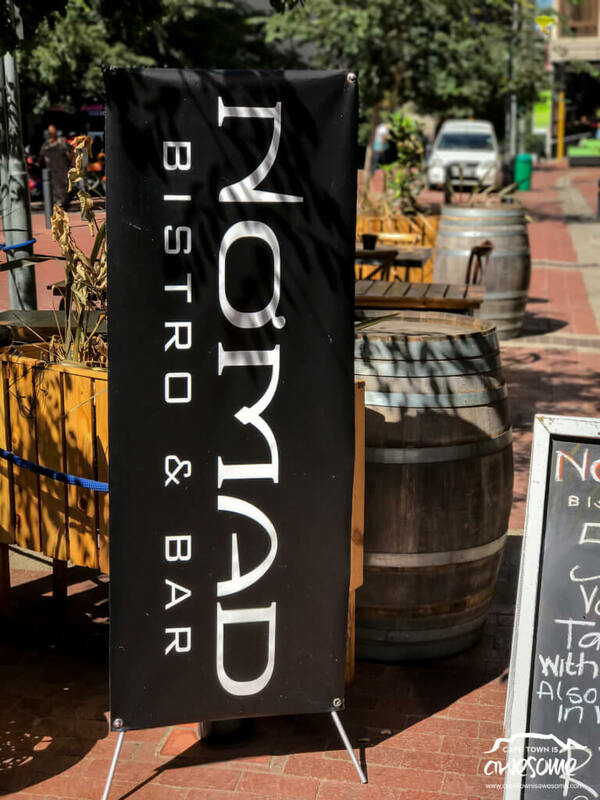 Since its rebrand at the start of 2017, NOMAD Bistro & Bar has fast established itself as one of the most ‘happening’ eateries on the Cape Town scene. The venue stays open until 2 a.m. six nights a week – far later than most competitors – and has events running on each of them. They also run regular competitions on Facebook, which offer winners tickets and free booze! 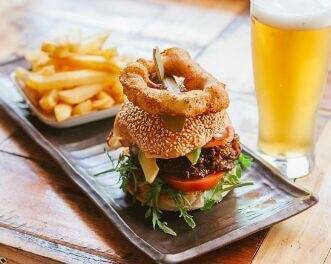 If dinner and a show isn’t quite your thing, you can pop by for a quick lunch in the city. The décor is eclectic, with a purported steampunk theme. While this might sound a little tacky or over-the-top, in all honesty, it is executed in a fairly subtle way. Minimalist steampunk (or rather trendy, hipster, inner city joint) would probably be a better description for the overall vibe. The staff is friendly and easy-going. The menu is quite simple and unpretentious but still fairly imaginative. 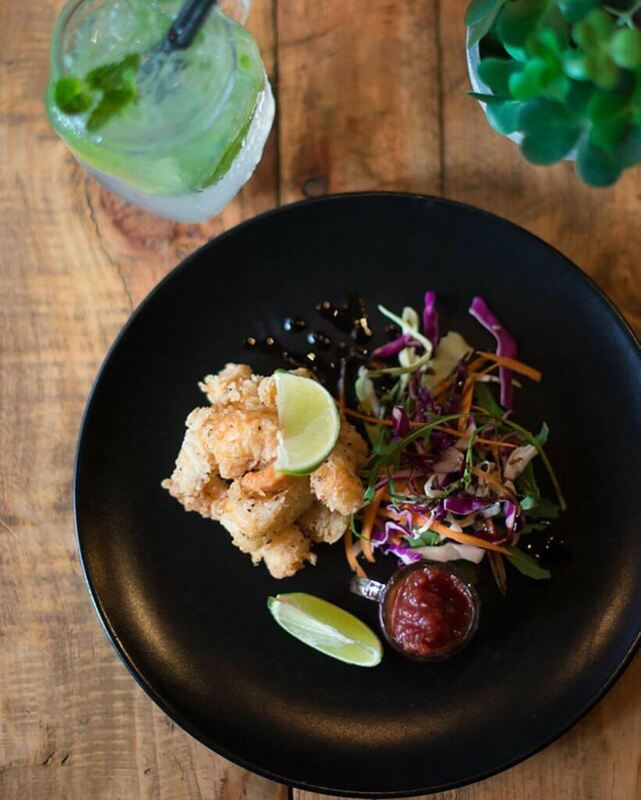 Given the tapas craze that’s hit Cape Town, it’s no surprise that this trendy spot offers its own spin on them. 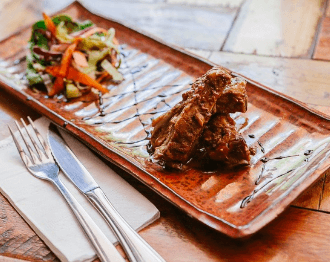 There’s salt and pepper calamari, pork loin riblets, risotto (a confusing addition to a tapas menu, but a creamy and delicious dish nonetheless), caramelised onion hummus and several other ‘fusion’ tapas. 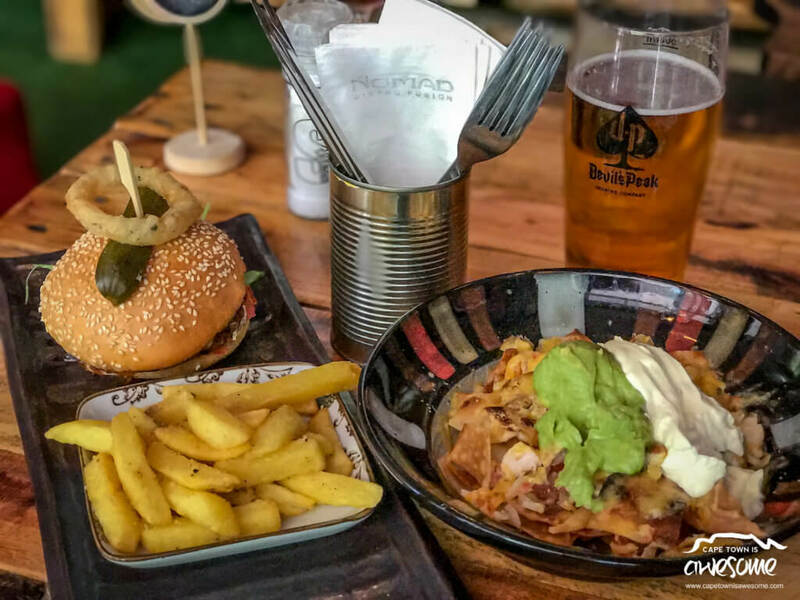 The dishes are priced from R45-R59, which seems very reasonable given its buzzy location and trendy clientele. If you’re not keen to build your own tapas platter, you can get one of the venue’s pre-selected ones. These are a standard Meze platter and a gourmet Cheese Board. Both are lovely options to share with friends over a few beers. 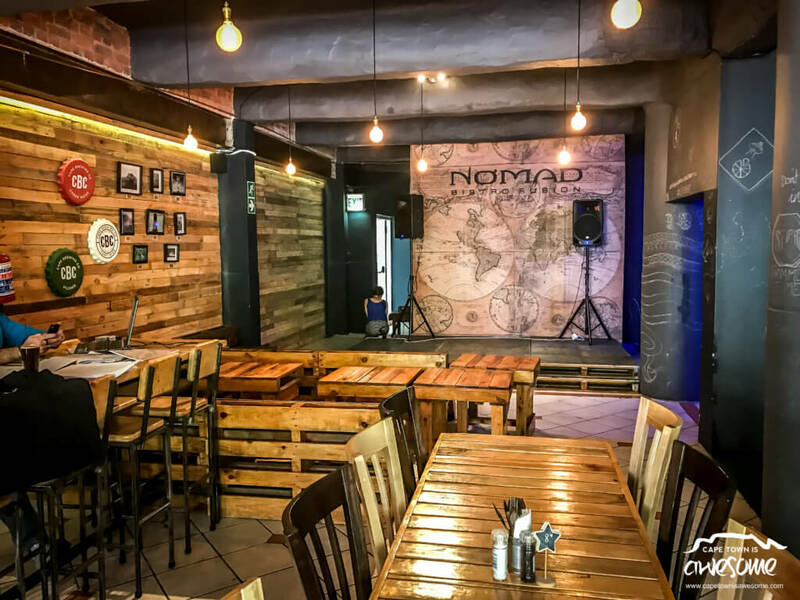 For those who don’t like sharing, NOMAD serves flatbreads, salads, pasta and burgers. At lunchtime, it also offers a range of open sandwiches which are perfectly suited to a quick bite. The burgers are, arguably, where NOMAD truly shines. Each is named after the city that inspired it, and the toppings are unusual and exciting. The Mumbai Sniper is perfect for adventurous eaters – the patty comes topped with aromatic tikka, peppadews and wild chilli Fraiche, which are interesting flavours to combine with a burger. The vegetarian burger, aptly named The Moroccan, has a falafel patty and comes topped with cheddar, grilled butternut and a peppadew sauce. There are several other, more standard, burgers. Prices are pretty standard, with most mains coming in just short of R100. 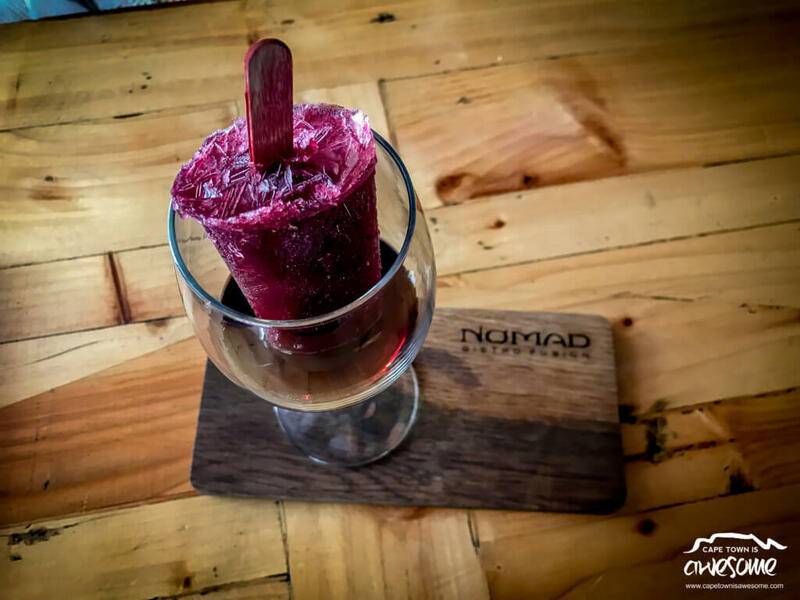 NOMAD Bistro and Bar serves a Red Wine “Adult” Popsicle that is quite fun. There is, of course, a reason NOMAD has the word ‘Bar’ in its title. Even their winter soup special comes with a Vodka-based sauce. 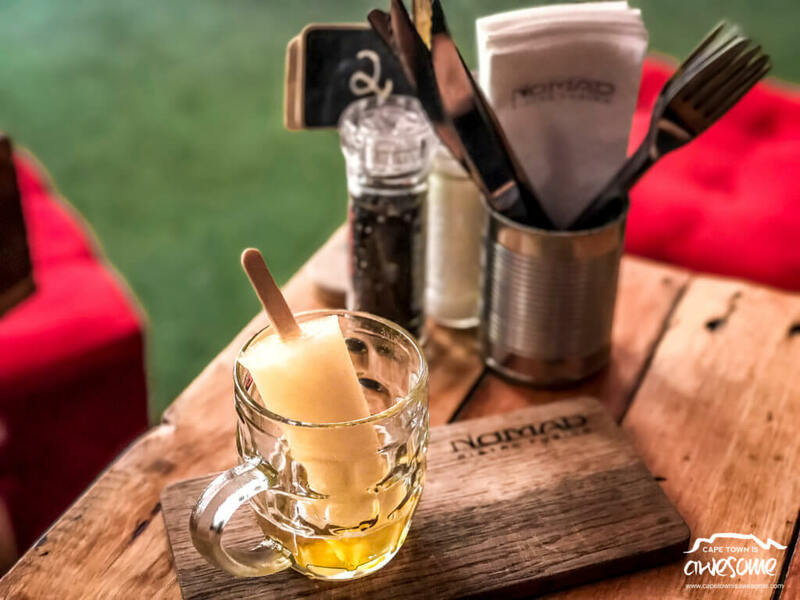 They have everything on offer from craft beers, to wines, cocktails and even adult popsicles! The latter are priced at R45 a pop and come in beer, white wine and red wine flavours! The emphasis in the drinks menu is on variety. 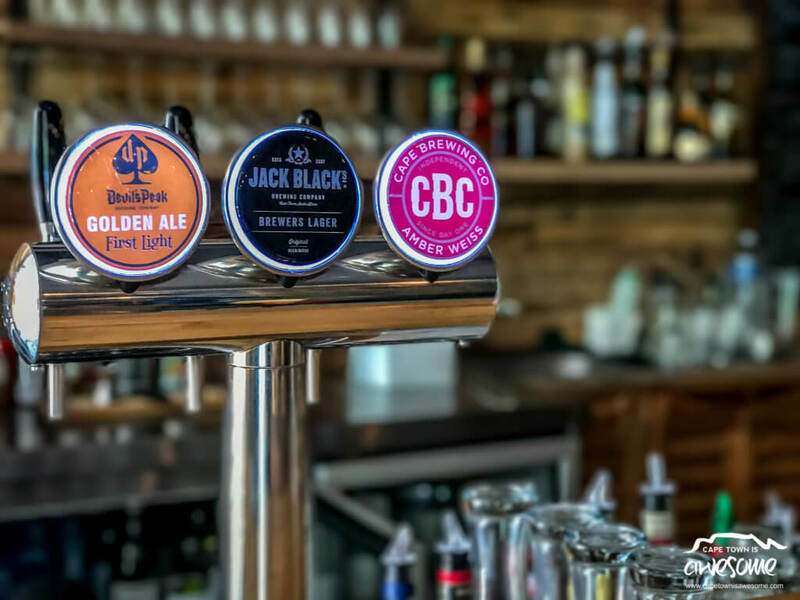 There are three craft beers on tap, several more sold by the bottle and at least seven imported beers. The wine list contains a range of local wines by the glass (and bottle) and several French wines too. The cocktails come laden with alcohol (the Robben Island Iced Tea stands out as a particularly boozy drink, and the Tequila Mocha-ing Bird is a hit!) and are a sure-fire way to kick off a fun night out. 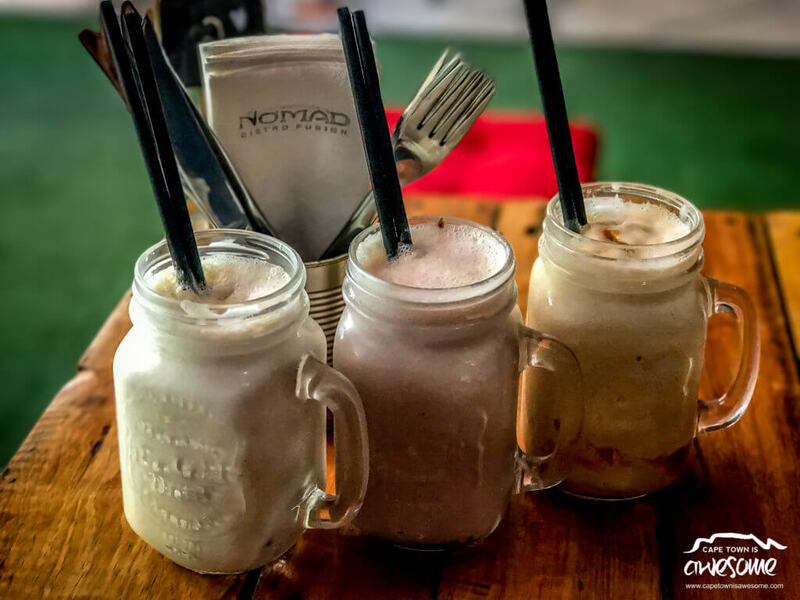 In all, NOMAD is perfect for a fun, raucous night out with all your friends. You’d probably do well to leave your kids (or your teetotaling friends) at home.